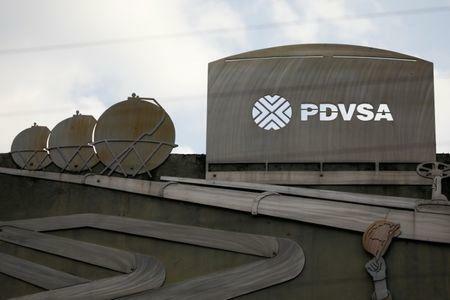 (Reuters) - Foreign partners of Venezuela's PDVSA are facing pressure from the state-run oil firm to publicly declare whether they will continue as minority stakeholders in Orinoco Belt projects following U.S. sanctions, three people familiar with the matter said. The sanctions on Petroleos de Venezuela (PDVSA), imposed last month in an attempt to dislodge Venezuelan President Nicolas Maduro, barred access to U.S. financial networks and oil supplies for the PDVSA joint ventures, pressuring the nation's already falling crude output and exports. PDVSA's Orinoco Belt joint venture partners, mostly U.S. or European companies, are facing difficulties getting cash-flow out of the country as a result of the sanctions, straining their ability to continue output and exports. France's Total SA, Norway's Equinor ASA, Russia's Rosneft and U.S.-based Chevron hold minority stakes in joint ventures with PDVSA that produce crude and operate oil upgraders capable of converting the country's extra-heavy oil into exportable grades. The four crude upgraders are capable of converting up to 700,000 barrels per day. The oil is exported by the joint ventures and each partner receive its share of the exports. Total believes it can stay in Venezuela, its Chief Executive Patrick Pouyanne said on Monday, although the firm last week said its bank accounts were blocked and it had evacuated its foreign employees. Equinor declined to comment on operational issues, referring questions to Petrocedeno, its joint venture with PDVSA. Chevron did not immediately reply to a request for comment. PDVSA last week ordered Petrocedeno to halt oil production and upgrading, due to a lack of naphtha to dilute the extra-heavy crude, according to sources from the project. The Petrocedeno-PDVSA venture's 220,000-bpd upgrader was already out of service when the decision was made, one of the people said. It is unclear when oil output will be halted. India's Reliance and PDVSA's U.S. unit Citgo Petroleum are the main suppliers of naphtha to Venezuela, according to internal PDVSA data. Those flows have declined since sanctions took effect on Jan. 28, according to Refinitiv Eikon data.